Rockies starter German Márquez lost his no-hit bid in the eighth inning against the Giants on Sunday afternoon. The Giants and Rockies toughed it out during an 18-inning showdown on Friday night, a game that finally landed in the Giants' favor on a... walk-off fielder's choice? Bryce Harper has a new home in Philly. What does that mean for the balance of power in the NL? Larry Baer, San Francisco Giants C.E.O., Is Suspended by M.L.B. Mr. Baer had been on a leave of absence since March 4, days after a video surfaced of him in an altercation with his wife. Larry Baer, San Francisco Giants’ C.E.O., Is Suspended by M.L.B. He will have no control over the team until then and will be evaluated for counseling. Does the addition of Manny Machado make the Padres a threat to the Dodgers in the NL West? The mayor, London N. Breed, backed a call by civic groups for “firm and appropriate action” to be taken against Larry Baer for a public altercation with his wife. Each team's lineup will first have to go to the commissioner's office as part of its gambling deal with MGM Resorts International. One unnamed manager said, "I'm really bothered by this." Giants outfielder Cameron Maybin was arrested on suspicion of DUI early Friday morning in Scottsdale, Arizona. The Giants say this was Larry Baer's request. What should Major League Baseball do to Larry Baer? The police and Major League Baseball said they were each looking into the episode, which happened on Friday and parts of which were captured on video. Giants CEO Larry Baer appeared to be trying to pry a cell phone out of her hands. The Phillies may not be the only team willing to commit $300 million to Bryce Harper. Bryce Harper met with the brain trust of the Phillies and Dodgers in the past week as well. It seems to be down to the Phillies, Giants and Dodgers. Giants president of baseball operations Farhan Zaidi knows he will eventually have to start compiling a list of potential candidates to succeed Bruce Bochy as manager, but the upcoming search isn't currently at the forefront of his mind. Buster Posey has known only one manager since making his debut with the Giants a decade ago. 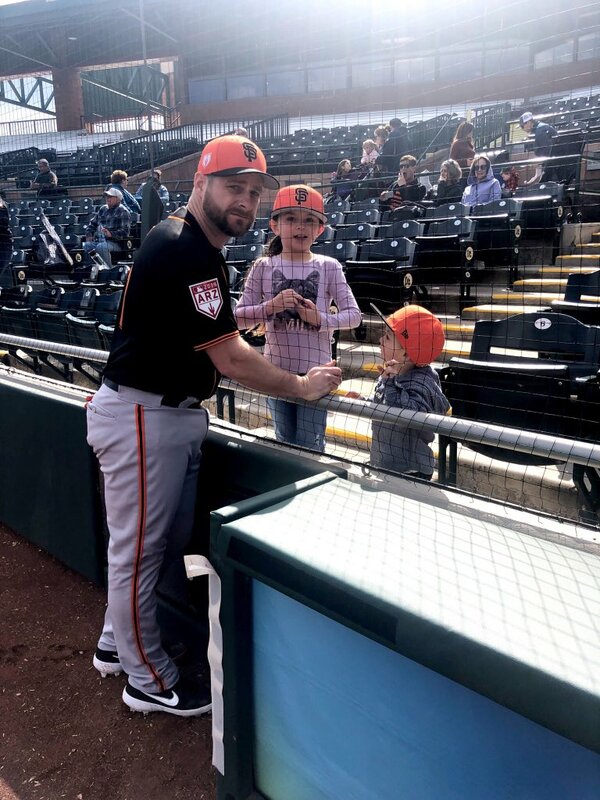 While it's hard for him to envision playing for someone other than Bruce Bochy, he wasn't surprised to hear about his longtime manager's plans to retire after the 2019 season. Bruce Bochy announced on Monday that his 25th season as a manager -- his 13th in an absurdly successful run with the Giants -- would be his last. In making the announcement, Bochy is going to give all of us the opportunity to say thanks during a 2019 season that will be something of a victory lap whether he likes it or not. 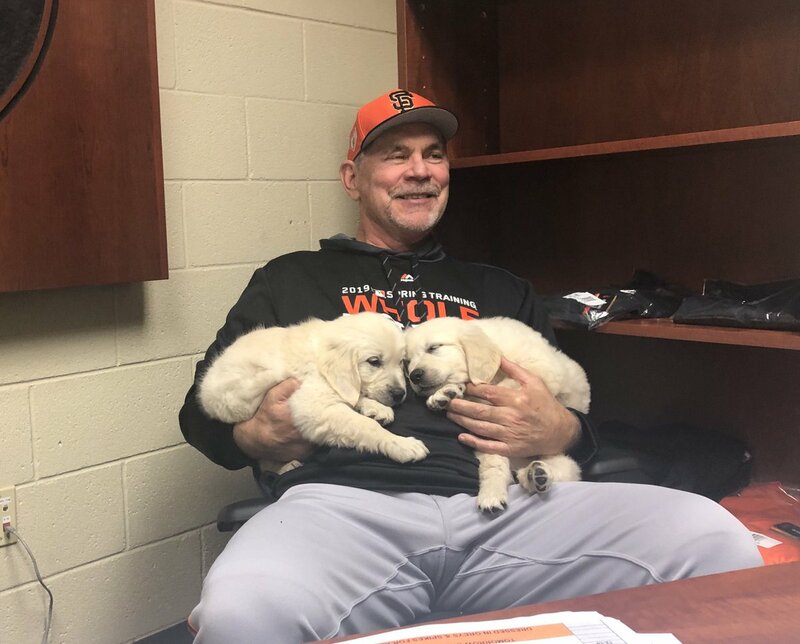 Bruce Bochy, who guided the Giants to three World Series championships in 2010, '12 and '14, announced Monday that he will retire at the end of the 2019 season, capping a celebrated 25-year managerial career in the Majors. This will be Bruce Bochy's 25th, and final, year as a big league manager. Giants manager Bruce Bochy said on Monday he will retire after the 2019 season. Heading into his 13th year in the Majors, Cameron Maybin brings a fresh approach at the plate and a revamped swing as he looks to carve out playing time in the Giants' outfield. Pablo Sandoval said he recruited his friends Gerardo Parra and Yangervis Solarte to the Giants in the offseason. Four days after signing Gerardo Parra, the Giants are close to adding another veteran reinforcement to their crop of outfielders. The Giants are working to finalize a Minor League deal with outfielder Cameron Maybin, according to a report from Andrew Baggarly and Ken Rosenthal of The Athletic.